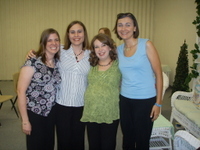 While I was disappointed to have missed the Yarn Harlot in Austin this weekend, I had the opportunity to be at one of my best college friend’s baby shower and to see all my girlfriends from college. At the baby shower, my secret sewing project was revealed. And she liked it!!! It was pretty cool because another girl made her a playmat and a cart cover out of the same material, so they coordinate but they are different. Here are some close-ups. 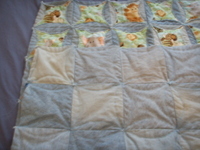 I had a lot of fun making this project and it definitely improved my sewing skills. I made it with two different cotton fabric patterns and jeans I wore in college. Hopefully it will be something that will be useful for Em and her soon-to-come baby boy. It was even worth sticking a sewing machine needle through my finger, accidentally, of course. For those of you who pop in that knew us in college, here’s a pic, minus Jen as she didn’t fly in until today (seriously, could I be taller?). It’s so gorgeous, Sarah! Great job. And you look beautiful in that picture, tall lady! Wow – the blanket is beautiful. What an awesome job! The official word from the Mom-to-Be: Love, love, LOVE it!!! I am totally impressed and it was definitely worth being kept in the dark for a little while! 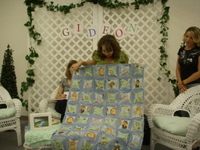 Gideon will love what his Aunt Sarah made for him!! Oh, I love it! I enjoy the Stain Glass window pattern, but haven’t done one since college. Great job! that came out AWESOME! What a fabulous gift!!!! I love that you used your old college jeans too!!! that rocks!!! What a great idea! I’ve seen quilts done with the “college” T-shirts, but like the jeans much better. Beautiful job! 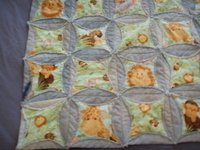 Absolutely gorgeous blanket – I am sure she will treasure it and always think of you when she wraps her little one with it.